Eureka! Light is a wave ! 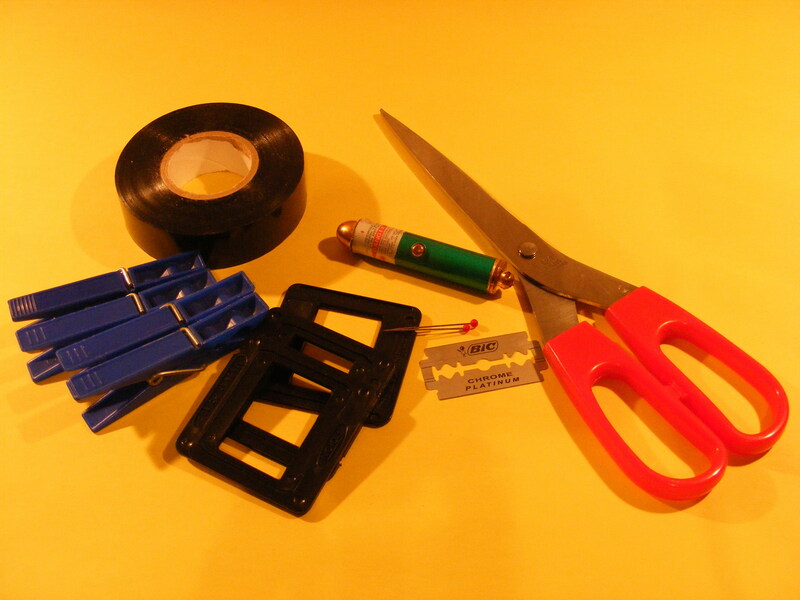 Home Exercises Classroom experiments and activities Eureka! Light is a wave ! Eureka! Light is a wave! We would like that our students could shout it with full conviction. In order to achieve it we can allow them to "play" in a darkened lab to make them discover phenomena of diffraction and light interference with use of simple and low-cost instruments. Availability of those instruments makes it possible to create in a classroom a number of stands for studying those phenomena. If conducting experiments during lessons is impossible or difficult, the experiments suggested by us can well be made at home by students. All experiments described here were conducted by the author of that paper at home during long autumn evenings. And there are still many more dark evenings to come, when all those experiments can be performed by our students. Do not point laser beam into anyone's eyes! There is a danger of permanent damage to vision! 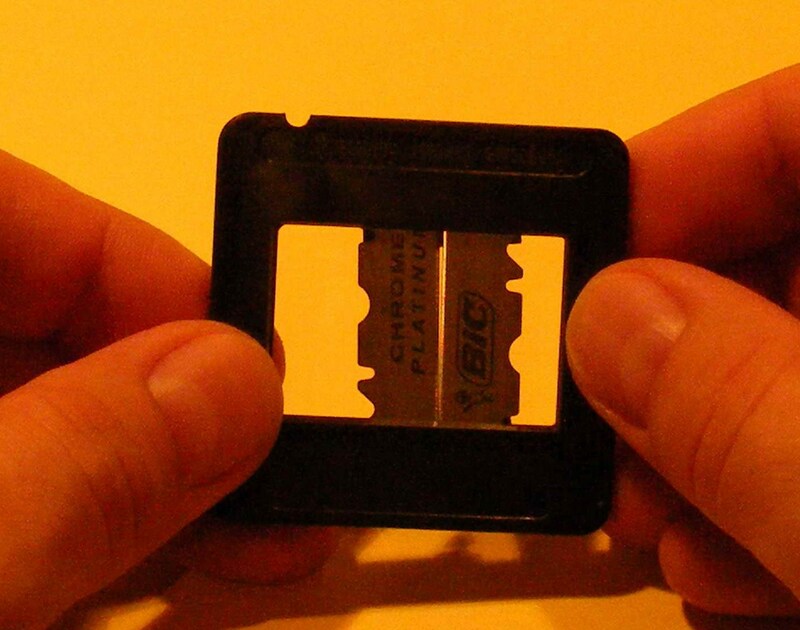 Take special precautions when preparing razor blades - their cutting edge can cut your skin! screen (white wall or white paper stuck to the wall). A pointer used in an exercise does not have to be of high quality. The one visible in the picture cost 5 PLN (1.5 Euro). 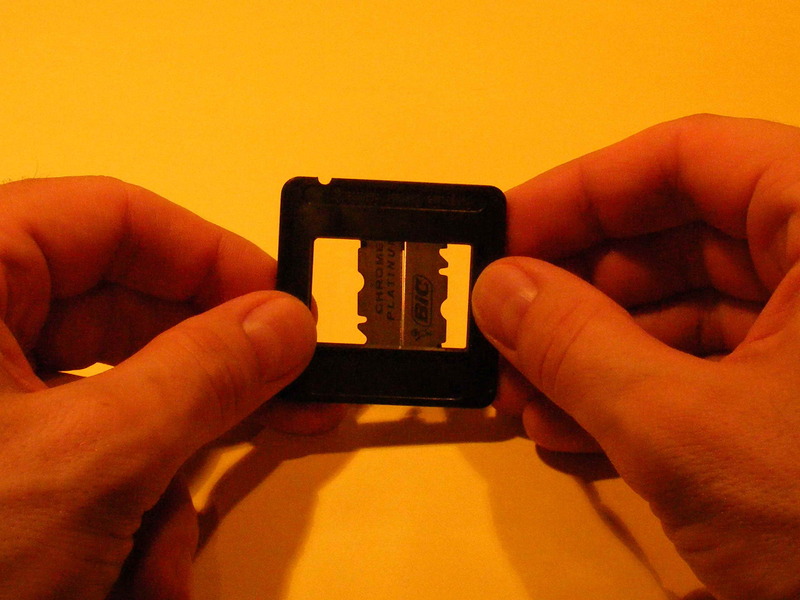 Use scissors to cut a razor blade along in two halves and then trim them to reach a proper length. 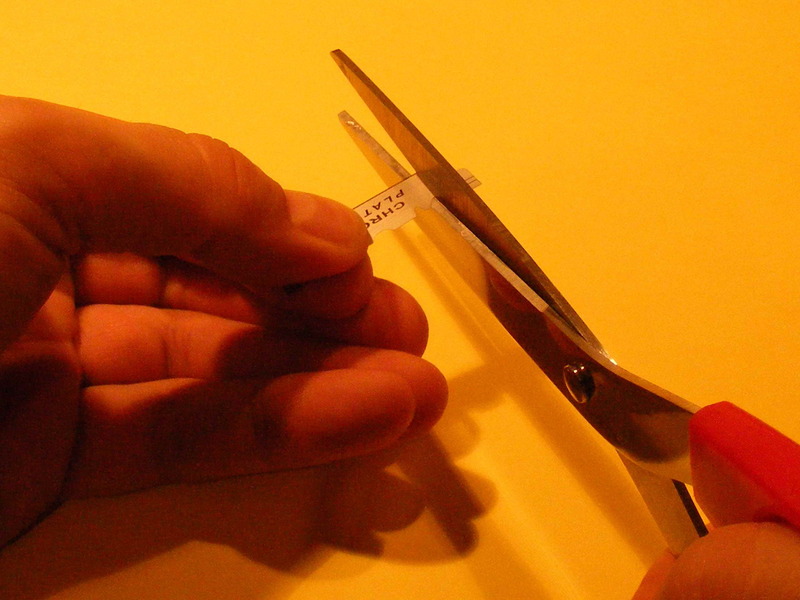 With adhesive tape stick halves of razor blade to a slide frame, so that cutting edges of razor blades created a slit of growing width (maximum width should have about 1mm). Close the frame. 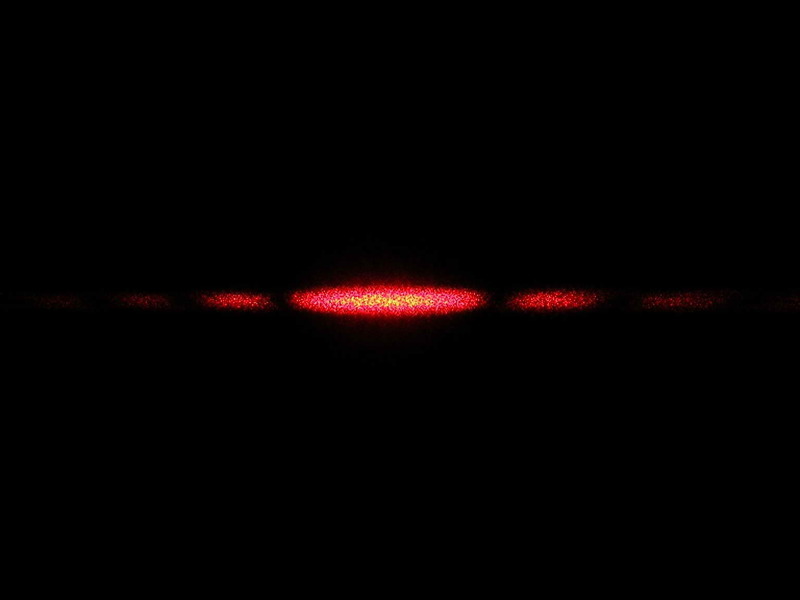 A slit to investigate a light diffraction phenomenon with a single slit is ready! Photo 4. 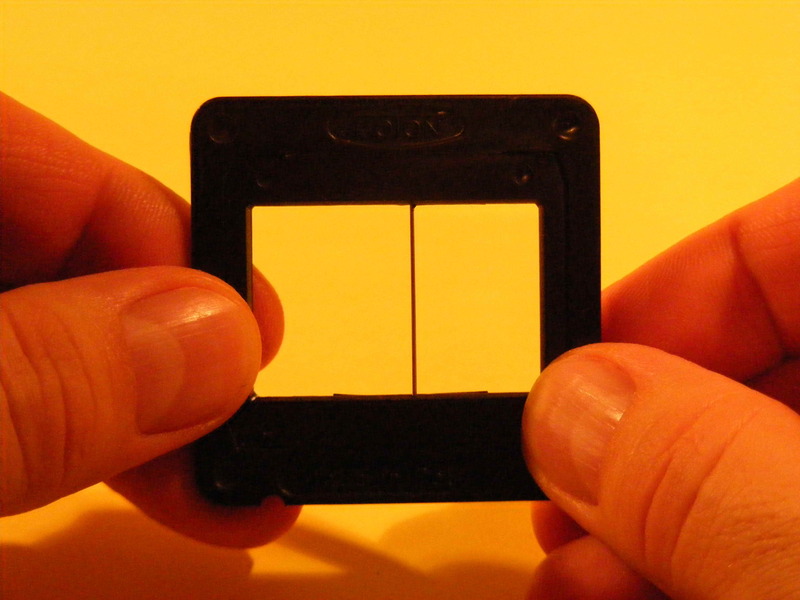 Frame with a slit. Using a clothes peg put a frame in a vertical position. 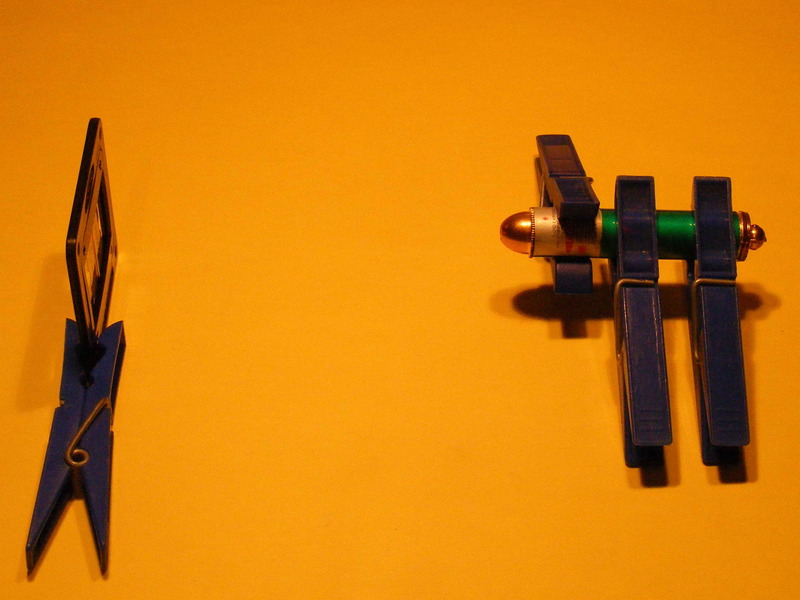 Other clothes pegs use to position a laser pointer. 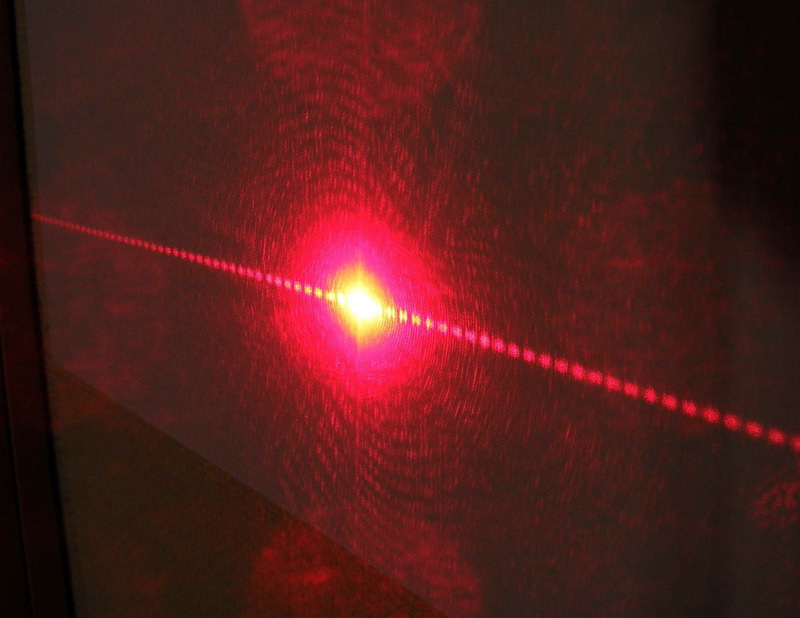 Point laser beam through a slit at a white screen (wall) placed at a distance of about 2m. Adjusting a part of slit through which a laser beam goes, we can investigate how diffraction image depends on slit width. 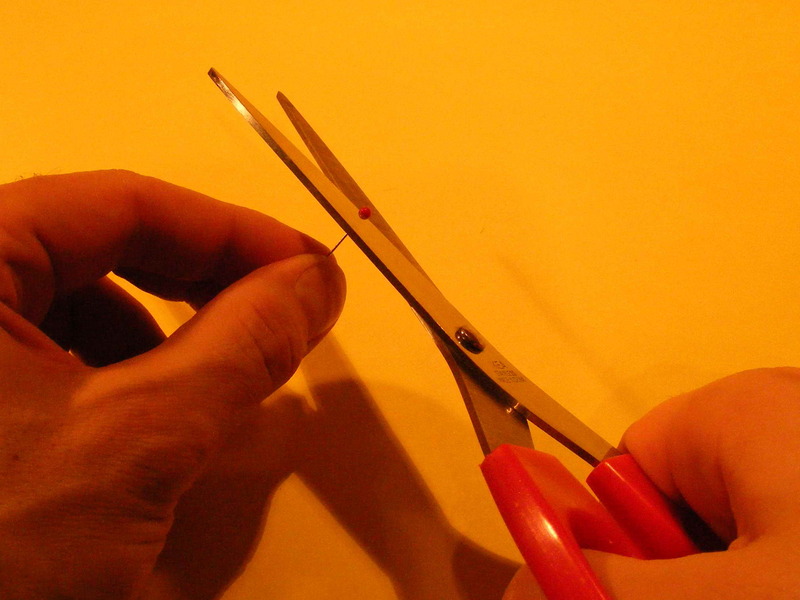 With scissors cut a razor blade along in two halves and then trim them to reach a proper length. Cut off a pinhead. 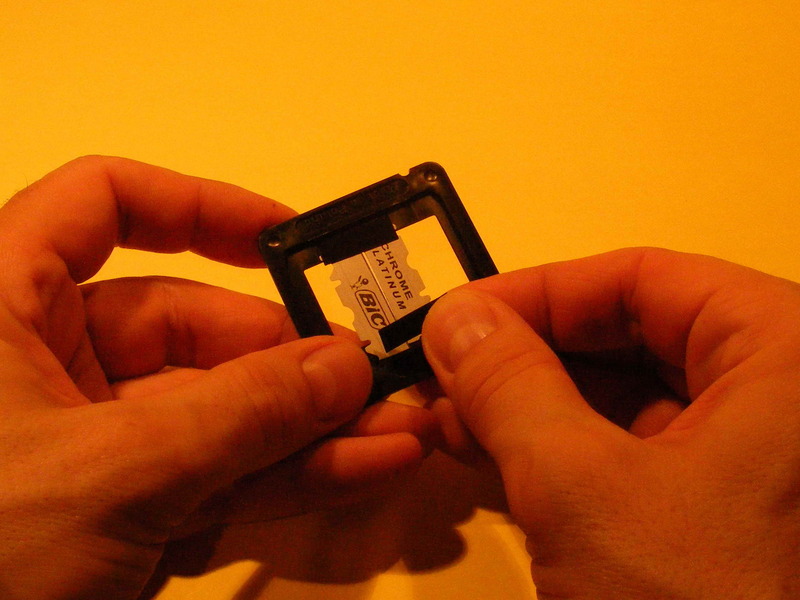 With adhesive tape stick halves of razor blade to a slide frame, so that cutting edges of razor blades created a slit of width about 2.5mm. 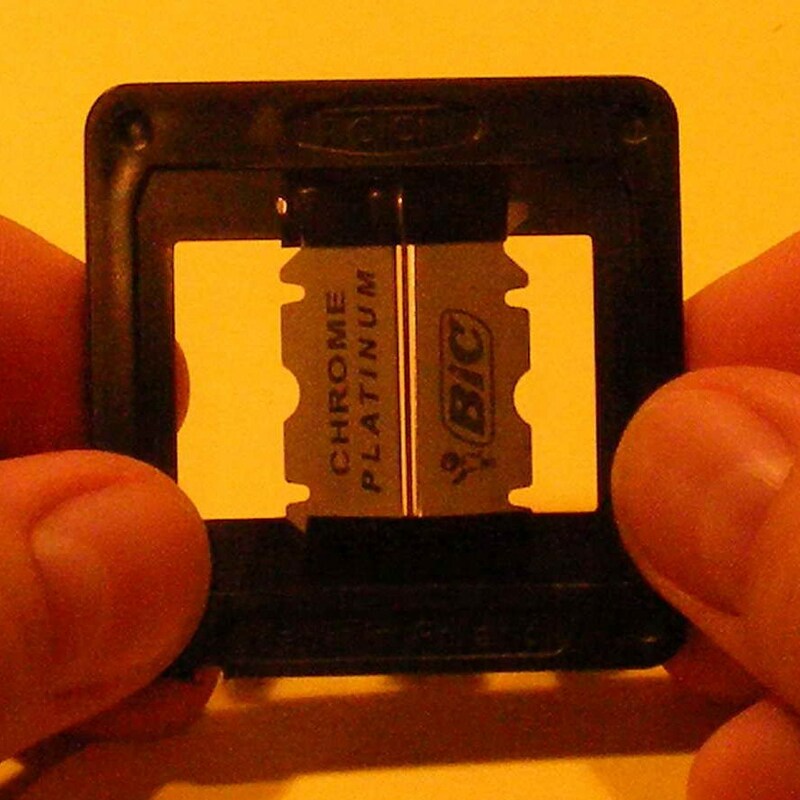 Between razor blades stick a pin to create two slits of width about 0.8 mm each. 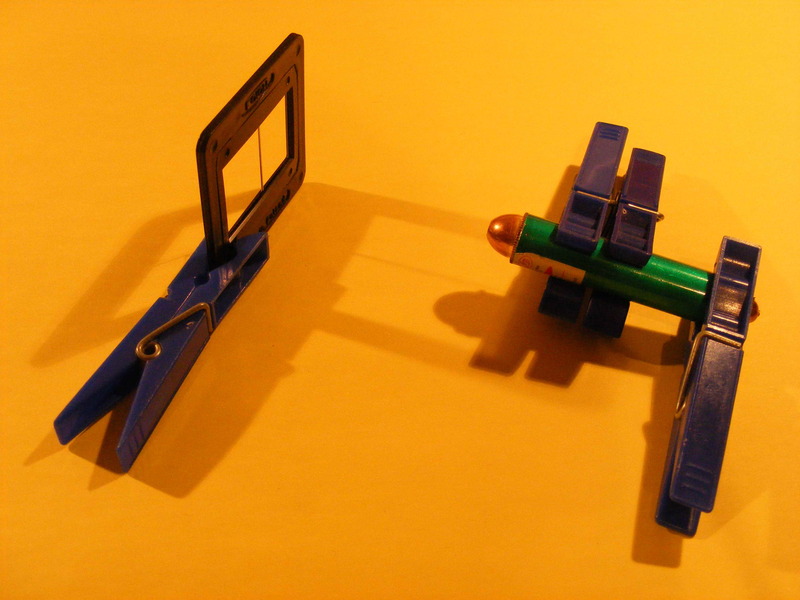 Similarly as before, position a frame and a laser pointer using clothes pegs. 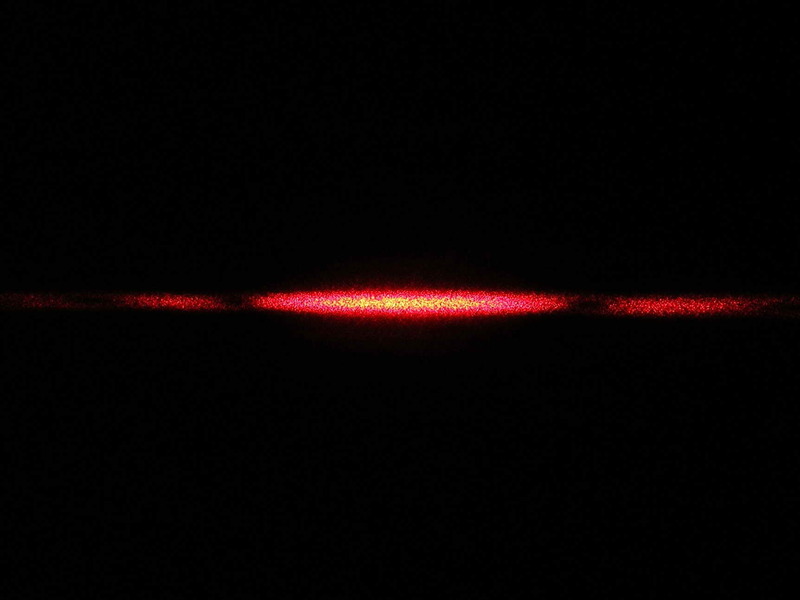 Point laser beam through a slit at a white screen (wall) placed at a distance of about 2m. With scissors cut off a pinhead. 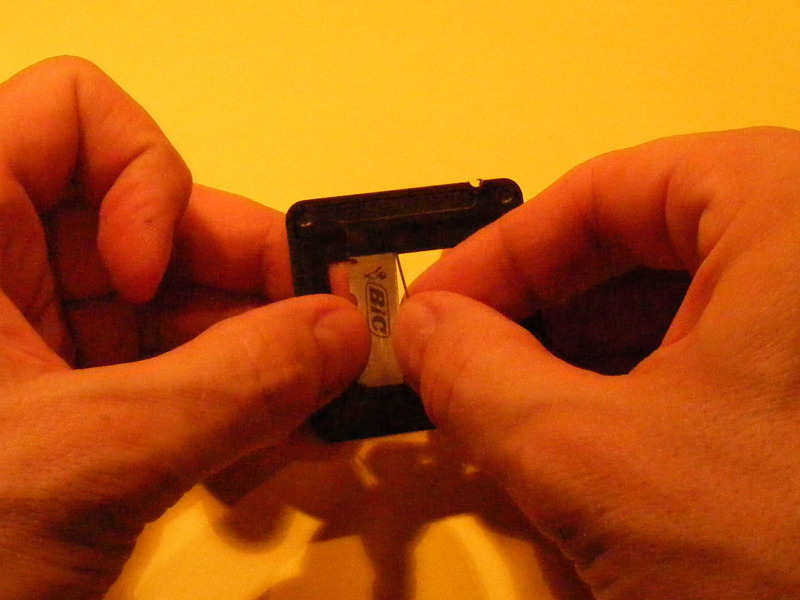 With an adhesive tape stick a pin without a head to a frame. Similarly as before, put a frame in a vertical position using clothes pegs. Then position a laser pointer also using clothes pegs. 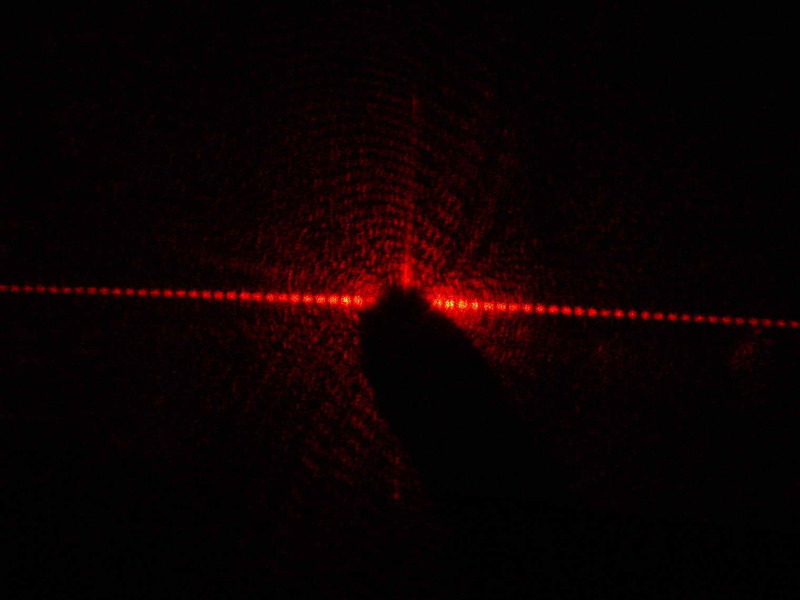 Point laser beam through a slit at a white screen (wall) placed at a distance of about 2m. Photo 11. Frame and an experimental set to investigate a phenomenon of interference at a single pin. Photo 12. 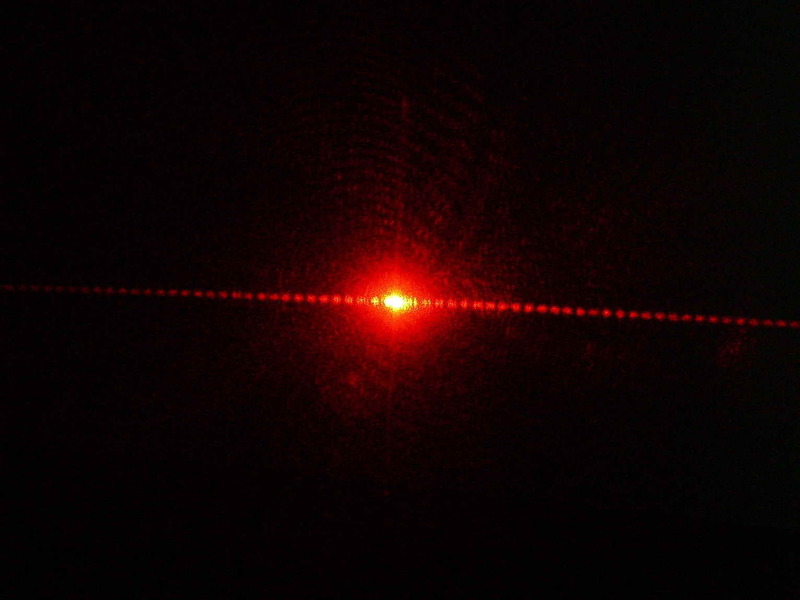 Diffraction images of a single slit. 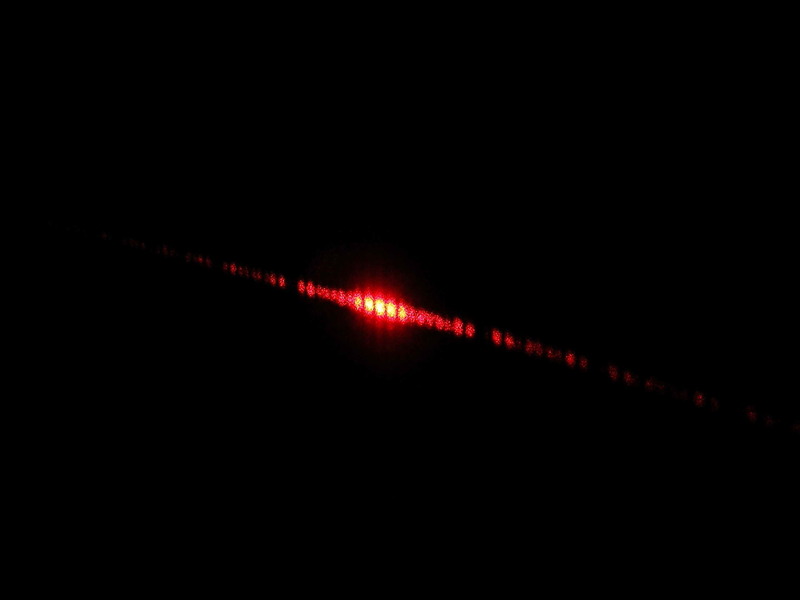 It is easy to spot that the less width of a slit through which light beam goes, the bigger width of a received diffraction image. The central stripe is wider than stripes in next rows. The further from the image center the lower the screen lighting intensity is. It causes some trouble in receiving a good photo. When there are visible details of the central stripe, stripes in higher rows are invisible. When there are visible stripes of higher rows, the central stripe is overexposed. Photo 13. Interference image when the light went through two slits. On the screen there are visible parallel stripes of the same width and equally distanced. Also in that case we will can problems to get a good photo. When there are visible details of the central stripe, stripes in higher rows are invisible. When there are visible stripes of higher rows, the central stripe is overexposed. Photo 14. Interference image of an obstacle (single pin). On the screen there are visible interference stripes with lower and lower intensity. The central stripe is intensively exposed, whereas higher-row stripes are definitely darker. That causes problems with taking photo.